Using the daily data collected through Kantar-GeoPoll Media Measurement, GeoPoll has analyzed the top TV stations in Uganda and Rwanda for Q4 2015, October – December. 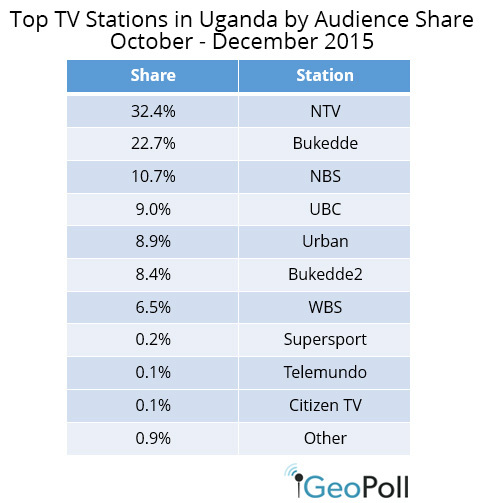 We examined both ratings* and share** for the top TV stations in Uganda and Rwanda. The below chart shows the average ratings for the top 10 stations in Uganda during prime time, from 19:00 to 22:00. 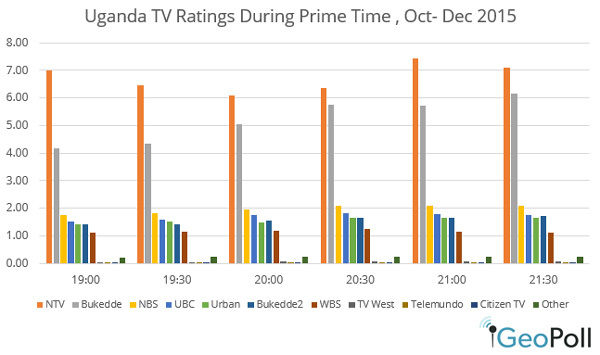 As displayed in the above chart, NTV gets the highest ratings during prime time followed by Bukedde TV. Bukedde’s ratings ratings steadily rise from 19:00 to 21:30 where it has the highest ratings. NBS maintains third place from 19:00 to 21:30 followed by UBC. Urban TV and Bukedde 2 interchange the 4th and 5th place between 19:00 and 21:30 while WBS maintains 5th place. Compared to Q3, NTV’s share increased by 1.3% and Bukkede increased by 0.23%. NBS was in third place in both Q3 and Q4, and increased share by 0.5% from Q3. UBC maintained forth place but lost 0.9% share. The below chart shows the average ratings for the top 10 stations in Rwanda during the day from 06:00 to 22:00. 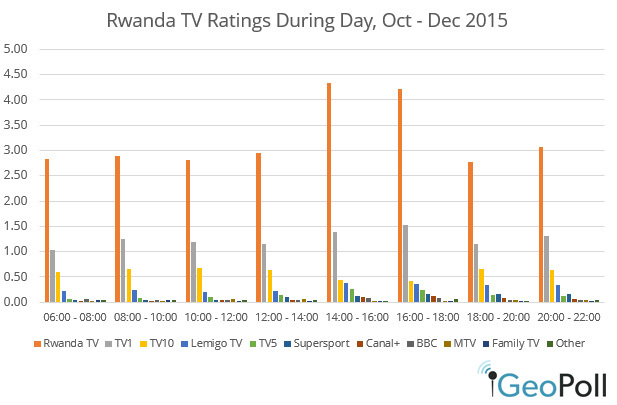 GeoPoll found that Rwanda TV has the highest ratings throughout the day with the peak being from 14:00 – 16:00. This is followed by TV1. TV10 has higher ratings than Lemigo TV throughout the day. TV5, Family TV, BBC, Supersport, France24 and other stations have low ratings throughout the day. 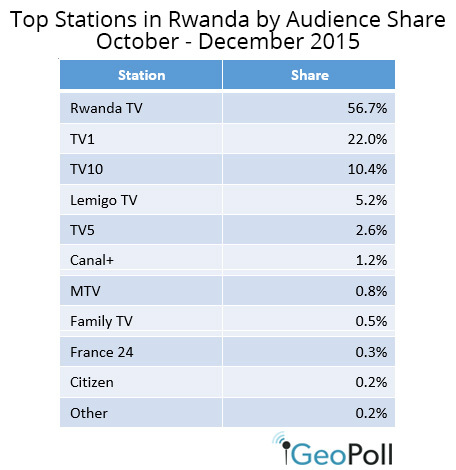 Compared to Q3 share, Rwanda TV lost 3.0% of its audience share but continued to be the dominant station. TV1 and TV10 both grew their audience shares by 2.7% and 2.9% respectively, while Canal+ and TV5 switched positions from Q3, with Canal+ dropping to 6th position and losing 2.2% of its audience share. For more detailed TV ratings from Uganda, Rwanda, as well Kenya, Ghana, Nigeria, Tanzania, the Democratic Republic of Congo, and Mozambique contact us to learn more about Kantar-GeoPoll Media Measurement, the leading audience measurement service for TV, radio, and print in Africa.